No matter what type of potato plant (Solanum tuberosum) you choose to grow, start by planting certified seed potatoes, available from reputable seed catalogs and plant nurseries. Unlike grocery store potatoes, which are chemically treated to prevent sprouting, seed potatoes perform well and provide a quality crop with minimal problems. Although potato is a cool-season crop that can be planted any time after the danger of frost has passed, its optimal growing temperatures range from 68 to 77 degrees Fahrenheit. You can choose from many potato cultivars and varieties, ranging from plants such as "Catalina" that produce white-skinned tubers and yellow-skinned tuber plants such as "German Butterball" to red-skinned tuber plants that include "Red Thumb" and fingerling potatoes. Some of the more rugged cultivars include "Butte," "Elba," "Onaway," "Caribe," "Red Dale" and "King Harry." If you live in the cooler climates typical of the northern United States, you can usually plant potatoes in spring for a summer harvest or in summer for a fall harvest. If you live in the warmer climate typical of the U.S. South, then plant potatoes in late winter or early spring to harvest the crop before the heat of summer. Tubers need 70 to 150 days after planting time to mature enough for harvest, depending on the cultivar grown. If you have gardening space in the ground, then try planting seed potatoes in straight, shallow trenches that are about 3 feet apart. Space the seed potatoes 1 foot apart, with each one's eye -- a small, dark spot from which a stem will grow -- facing upward, and cover the seed potatoes with 3 to 4 inches of soil. Another method is to place seed potatoes on top of soil and cover them with 4 inches of seed-free straw mulch, which helps to retain soil moisture and prevent weed formation. If you're short on space, try growing potatoes in a grow bag or large container that can hold at least 5 gallons of water. Place several inches of soil mixed with compost at the bottom of the container. Place three or four seed potatoes on top of that mixture, and cover them with another 3 inches of the soil mixture. Add more soil as the plants start growing to keep their stems covered. Plant seed potatoes in an area with full-sun exposure and well-drained, acidic soil. In addition to providing optimal growing conditions, keeping the soil's pH level below 5.4 also prevents scab, a soil-borne disease. Most garden centers sell soil pH tests, which measure soil’s acidity level. Rotating the planting area every year and working plenty of organic material into the soil can help minimize potential problems with diseases. Water potato plants on a regular basis and deeply, starting after planting the seed potatoes. Watering is particularly important six to 10 weeks after planting, which is when the tubers begin developing. Apply enough water to moisten soil that is about 8 to 10 inches below the ground's surface. Once the young potato plants reach a height of 6 inches, begin hilling them by tilling the soil around each plant's base and burying the stems under a mound of loose soil. This method helps prevent potato plants from becoming sunburned, which leads to bitter-tasting tubers. Repeat the hilling process every two to four weeks to keep the plants' bases covered. Fertilize the soil either before or when planting seed potatoes to maximize the yield from your crop. Adding a boost of nutrients gives the potatoes a boost. The National Gardening Association recommends broadcasting a fertilizer such as a 5-10-10 commercial blend over the planting area, using about 1 1/2 quarts for every 125 square feet of soil surface. Till or rake the fertilizer into the top 4 inches of garden soil before you plant. Another option is to place one small handful of compost and another small handful of either bonemeal, which is 2-11-0, or superphosphate, which is 0-20-0, on the soil surface every 10 to 12 inches along a planting row just before you plant. Add 2 to 4 inches of soil over the fertilizer to create small mounds. 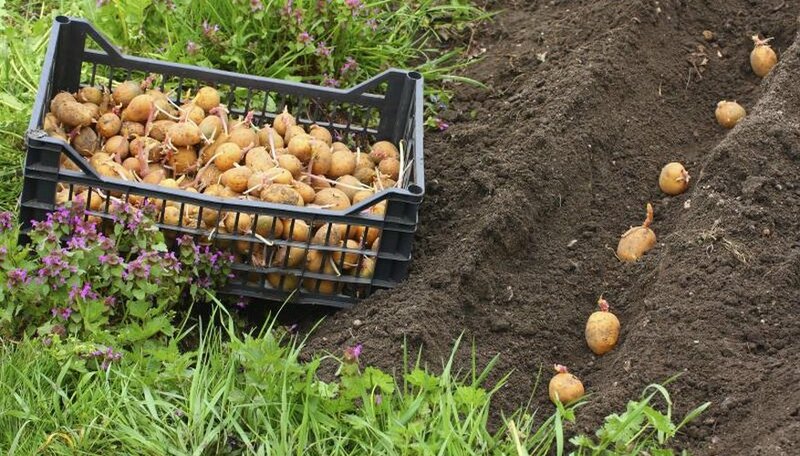 Plant the seed potatoes near the edges of the mounds without allowing them direct contact with the fertilizer mounds, which could damage young roots. The Complete Book of Potatoes; Hielke De Jong et al.